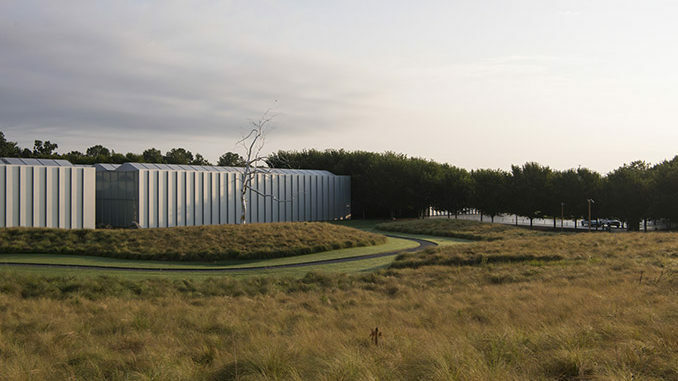 The North Carolina Museum of Art (NCMA) has completed a two-year-long redesign, expansion, and transformation of its Ann and Jim Goodnight Museum Park. 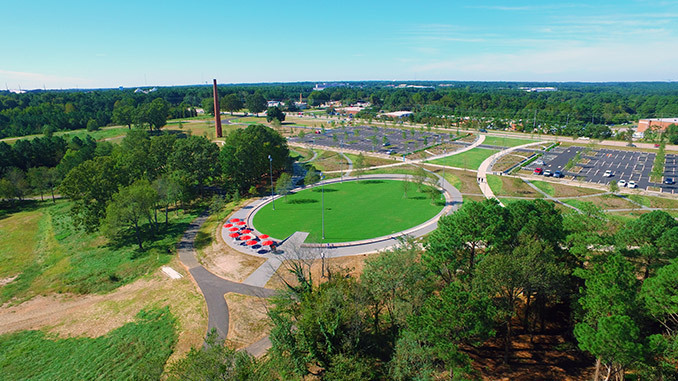 To unify the campus, the project includes new tree-lined parking, contemporary wave and parterre gardens, a promenade connecting Park and galleries, and the Ellipse—a spectacular lawn overlooking the Park’s rolling meadow. The Museum also installed significant sculptures by Giuseppe Penone and Hank Willis Thomas in the new gardens, with others, including two monumental works by Mark di Suvero, to follow. A public celebration is planned for November 6, with outdoor activities for all ages. The Museum enlisted landscape architecture and urban design firm Civitas, Inc., of Denver, Colorado, to develop the plan, led by the NCMA’s Dan Gottlieb, director of planning, design, and Museum Park. The Museum began construction in August 2015. 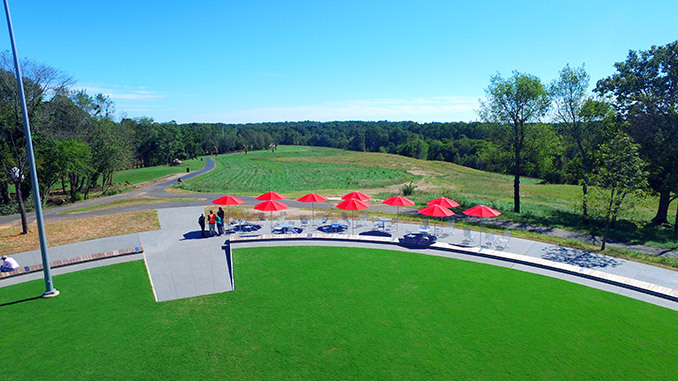 · The Ellipse: The manicured lawn is surrounded by a 600-foot elliptical wooden bench and a sparkling walkway with tables and chairs under red umbrellas overlooking the Park’s upper meadow. It is used for Museum and community programming, temporary public art installations, or just relaxing and playing. 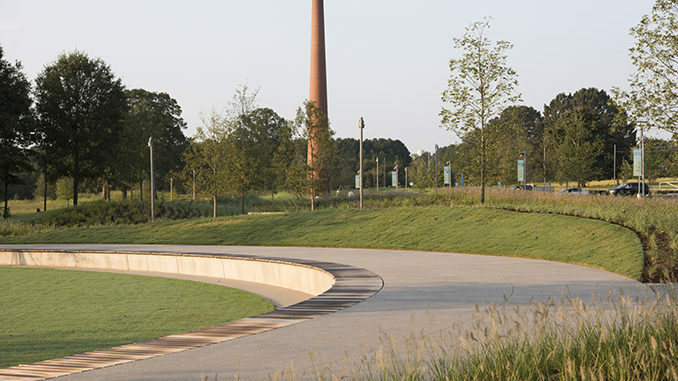 · The Promenade: This wide path connects the Museum’s galleries and the Park—winding from the Plaza to the Ellipse to the smokestack, past the wave gardens, works of art, and long views. 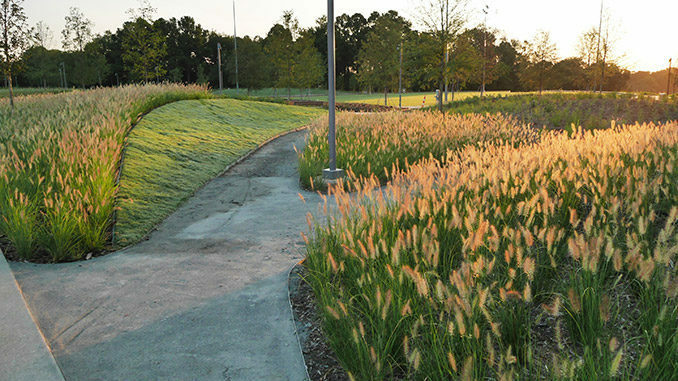 · Wave Gardens: Twenty mounded contemporary gardens are interlaced with paths and benches and are located along the promenade and Blue Ridge parking. The mounds are planted with more than 150,000 varied plants, creating waves of color and texture. 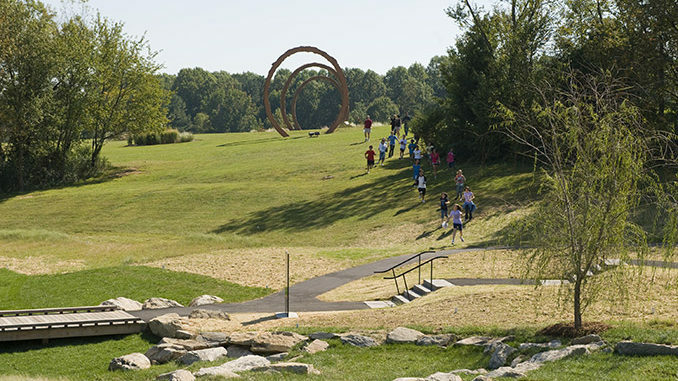 · Parterre Lawn and Gardens: These interior gardens connect the Ellipse and wave gardens to Blue Ridge Road. 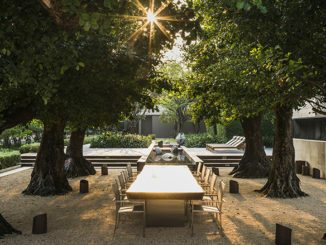 Two lawns, flanked by 10 raised and tilted gardens, are used for sculpture installations and events. 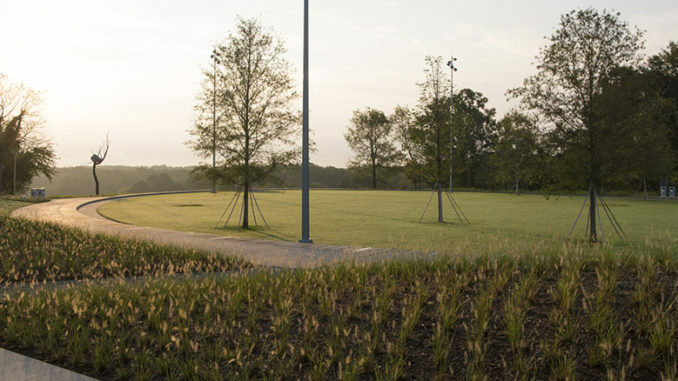 · New Blue Ridge Parking: More than 500 new parking spaces with tree-planted islands provide the experience of arriving at the NCMA through gardens. They are convenient to both the Park and gallery buildings. 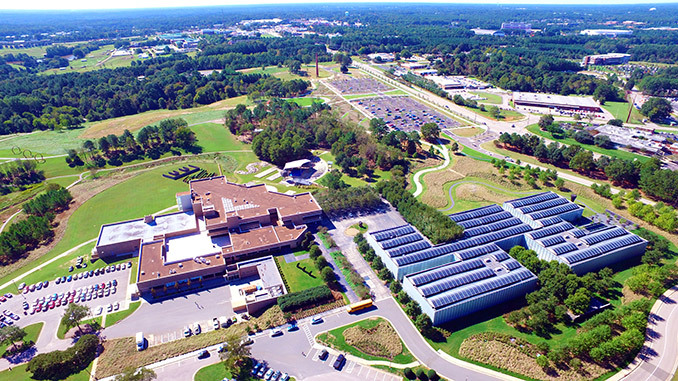 The Blue Ridge North lot is closest to buildings; the South lot is closest to the smokestack, the Capital Area Greenway, and District Drive. 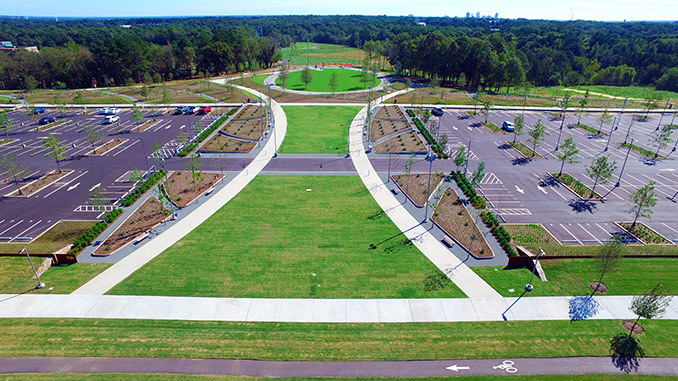 · New Street-Front Features: The street front is newly designed with a corten steel blade, planted berm, tree-lined bike and pedestrian path, and new campus entrance at District Drive. 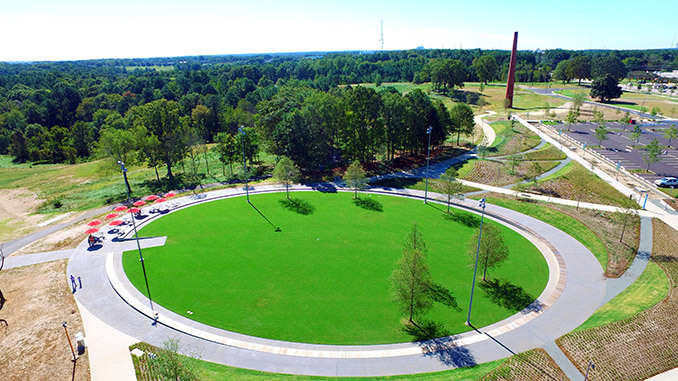 · Capital Area Greenway: Bicyclists using the Reedy Creek Trail from the pedestrian bridge over the I-440 Beltline can bike the new trail past the restored Vollis Simpson sculpture Wind Machine (to be reinstalled in late October) and the smokestack onto the Blue Ridge Road bike path. · Sustainable Measures: A 1,000-foot-long water quality garden catches water from parking areas and filters out pollutants through bioretention (plants); water then flows through a “dissipater,” composed of rubble from the former prison boiler house, before entering streams. 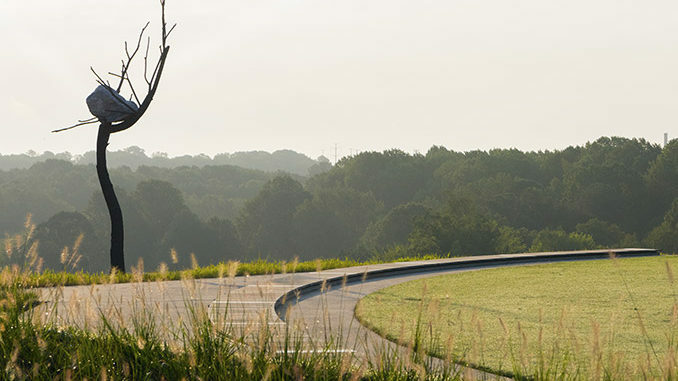 Two large hills were built in the Park’s upper meadow from 30,000 cubic yards of soil removed from the construction site, reshaping the landscape and reducing the carbon footprint and expense of hauling it off site. All new lighting fixtures use energy-efficient LED. 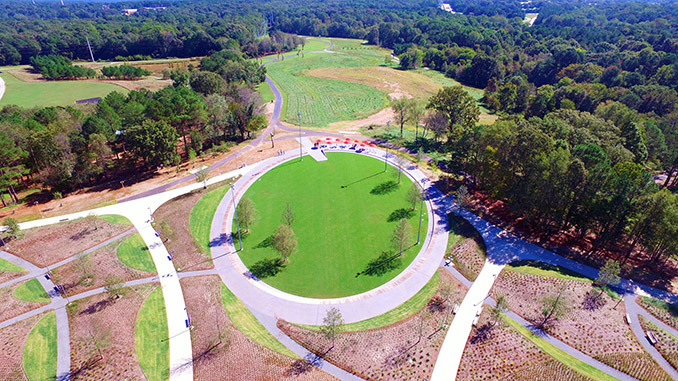 The Museum and Civitas, Inc., worked together to create a community-focused design for the Park, with emphasis on ways to use landscape design and art installation to foster creative, memorable experiences for the people of North Carolina and beyond. In planning the Park expansion, they hoped to expand access to art, form a new framework for public engagement, and create a sustainable future for the Museum as a place close to people’s lives. 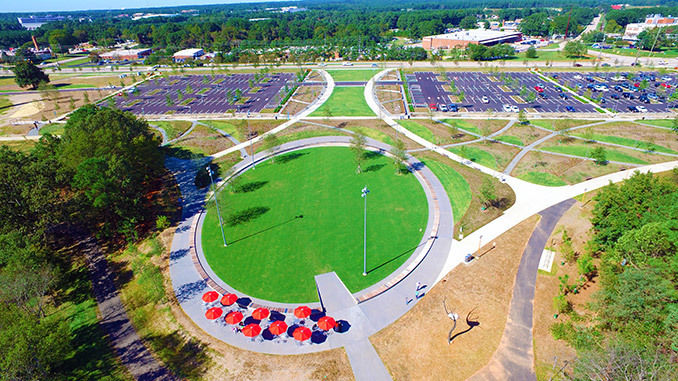 The Park already draws more than 150,000 annual visits; with the completion of the expansion project the Museum anticipates welcoming many more art, nature, and recreation enthusiasts. Long-term plans include expanded trails, environmental restoration projects, and additional works of art and programs. The grounds for the Museum and Park were used for various prison and military functions for almost 100 years, including a World War I tank training facility and youth prison. In 1983 the Museum opened its original building (now referred to as East Building) on the site. 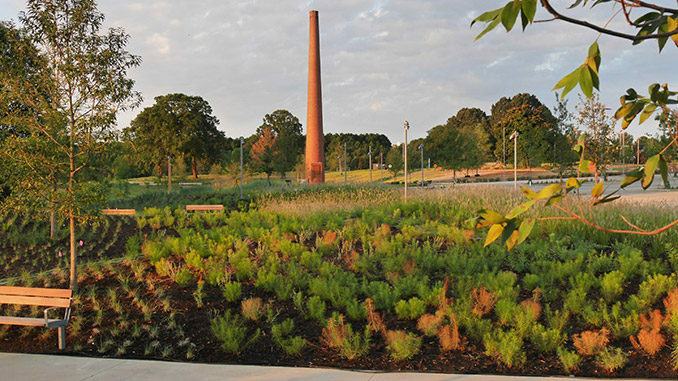 It is keeping parts of the prison in the design of the Park as a reminder of this history and a symbol of its transformation to cultural destination: a boiler house was demolished and its rubble used as part of a sustainable water quality system; a smokestack now stands tall as a work of art in itself, surrounded by a manicured lawn for games and leisure.